Germans took to the streets in Berlin, Hamburg and other major German cities late last month urging their government to ramp up efforts to eliminate coal use. The demonstrations took place as a national commission charged with charting a path towards eliminating coal met for the first time in Berlin, Deutsche Welle reported. Successfully transitioning from fossil fuel and nuclear power to emissions-free, renewable energy has been a central pillar of Chancellor Angela Merkel’s national government since Germany’s Energiewende energy policy platform was launched in March 2011 in the wake of the Fukushima nuclear power plant disaster in Japan. Investment in and deployment of solar, offshore wind, biomass power generation and heating has soared since. Renewable energy, including hydroelectric power, has increased rapidly, to the extent they now account for one-third of national electricity production. 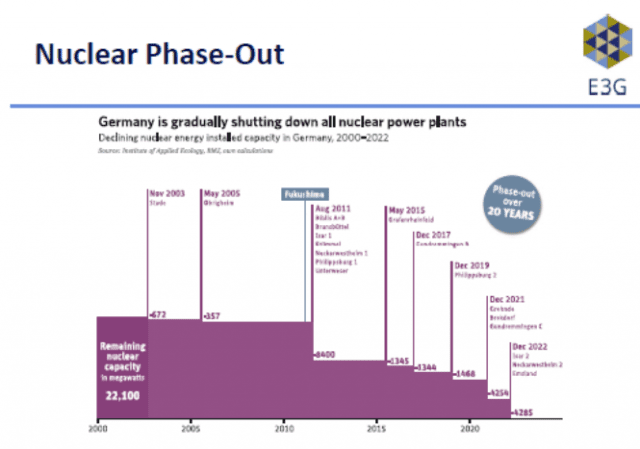 Phasing out Germany’s fleet of nuclear power plants have had some countervailing effects, however. German utilities increased their use of coal for power generation as a result, including lignite, a soft coal that produces a lot more in the way of carbon gas emissions and particulate matter than hard-rock forms of coal. Burning lignite produces some 22 percent of Germany’s electricity. Burning hard coal accounts for another 12 percent, according to official statistics. 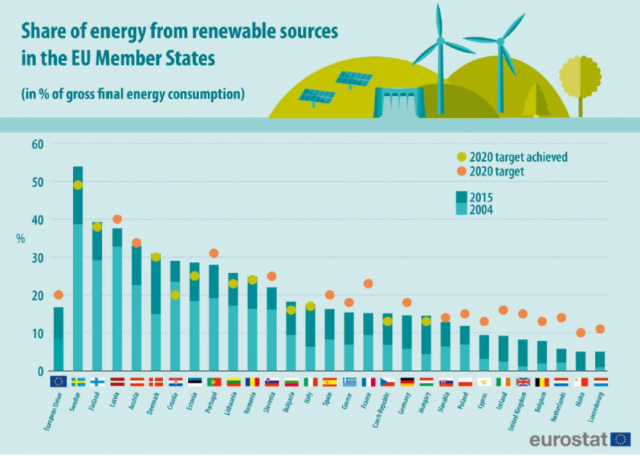 Eleven EU member nations had already reached their 2020 greenhouse gas emissions reductions goals, according to a March 2017 Eurostat report. Germany isn’t one of them. Germany’s environment minister, Svenja Schulze recently said it’s likely Germany will fail to meet its goal of reducing carbon emissions by 40 percent from 1990 levels by 2020. That is a sore point for Merkel and most Germans, the majority of whom strongly support the Energiewende policy. “It’s painful for me to have to tell you that we will miss the targets we’ve set for ourselves for 2020,” Schulze told delegates from more than 30 governments who had gathered in Berlin to prepare for an annual global climate summit in December, according to a news report. The lack of progress in definitively reversing the trend of Germany’s carbon and greenhouse gas emissions led thousands of Germans to take to the streets in five cities to urge government leaders to hasten elimination of coal use. All told, Germany’s carbon and other greenhouse gas emissions haven’t decreased for nine years as a result, according to WWF Germany, which organized the protests. Germany’s greenhouse gas emissions will drop by 32 percent or less by 2020, according to government agency estimates. The 2030 target aims for a 55 percent reduction from 1990 levels. 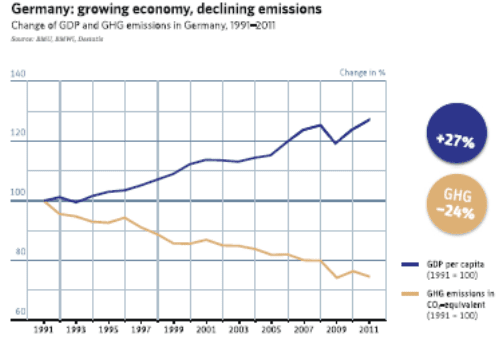 Germany’s latest Climate Action Plan sets the wrong course, according to WWF Germany. In particular, the plan advocates continuing to give industrial plants European Trading Scheme emissions allowances for free. “The Climate Action Plan thus continues to adhere to old emissions-intensive industrial processes and is not suitable for bringing about the transition to low carbon processes. 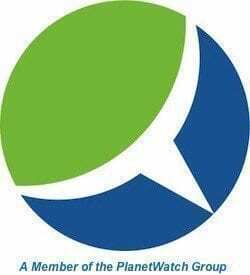 From WWF’s standpoint, the Climate Action Plan lacks credibility in this section and runs contrary to the self-imposed goal of far-reaching greenhouse gas neutrality,” WWF Germany states in its assessment report regarding Germany’s 2050 Climate Action Plan. Germany’s transportation sector lags the rest of the economy when it comes to reducing greenhouse gas emissions. That’s generally true worldwide, in all countries party to the UN Framework Convention on Climate Change and those who have pledged to do their part to reduce emissions aimed at limiting the rise in global mean temperature out to 2050 to 1.5 degrees Celsius as per the terms of the UN Paris climate change agreement. The lack of progress in the transportation sector has given rise to a so-called “electrification” movement. The lack of progress in the transportation sector has given rise to a so-called “electrification” movement. China, France, India, Norway and the UK have announced their intention to phase out petrol-fueled vehicles. Whether or not those are achieved will be a major determining factor in realizing the global community of nations climate change, renewable energy, and sustainable development goals.